Are you interested in cross-cultural learning whilst teaching students the art of “caring for others less fortunate”? Maybe your school or centre of learning should think about “adopting a HHCP Nepal school”? In 2011 HHCP Nepal put out a call to donors to purchase school uniforms for the students of Betang Primary School. This newly opened school had students attending although the families could not afford to purchase uniforms. 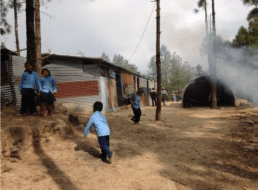 Dorothy Waide, Centre for Early Learning Griffith, Australia came to the rescue and have since formed a further alliance with this remote Nepali school. Letters, information and pictures have been traded and the children love learning about each others cultures. At the end of 2014, Stephanie Wardle, an employee of Dorothy Waide, visited this remote Nepali school personally. Not only did she spend some incredible time with these adopted school students, but she also engaged them in a dental hygiene program donating dental supplies to all. Stephanie brought many educational supplies, clothing donations and gifts that have been donated by her children in Australia. She and her family were received at Betang School with a very warm welcome!! If you would like to adopt a school or for any further enquiries please contact Harikrishna Devkota via our contact page.